Precipitate Trench Samples 3.0 metr | Precipitate Gold Corp.
Vancouver, B.C. - September 19, 2017 - Precipitate Gold Corp. (the "Company" or "Precipitate") (TSXV: PRG) is pleased to announce results from continuous rock chip channel sampling from the Southeast Zone at the Company's 100% owned Juan de Herrera Property in the Dominican Republic. 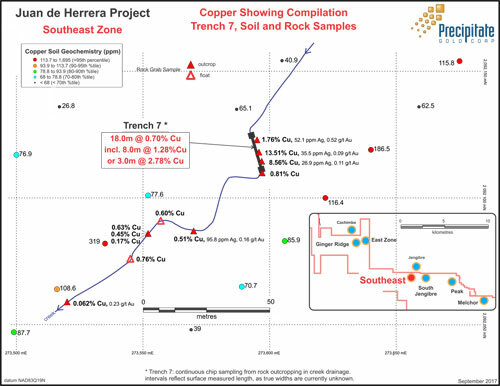 Precipitate has received results for continuous rock chip channel samples collected from Trench 7 at the new high-grade copper showing at the Southeast Zone, located approximately 6 kilometres southeast of the Ginger Ridge Zone. Sampling has yielded a highlight interval of 3.0 metres ("m") of 2.78% copper within a broader 18.0m of 0.7% copper. Surface rock grab samples collected up to 60 metres to the southwest report copper values up to 0.76%. See the accompanying map or the Company’s website for the Southeast Zone trench compilation map. The true width of the mineralized intervals is uncertain as the orientation of mineralization observed to date is not fully understood. Jeffrey Wilson, Precipitate’s President & CEO stated, "We’re pleased with these latest trench sampling results as they continue to support our belief that the Tireo Gold Camp is an excellent location for gold and copper exploration. Following the discovery of rock grab samples assaying 13.51% copper and 8.56% copper* collected within the Southeast Zone, crews returned to conduct the channel sampling reported today, then returned again to collect detailed soil samples from both the Southeast and nearby South Jengibre zones, as a means of better delineating these zones for additional work. The Trench 7 sampling data demarks a new high-grade copper showing located within a large area of multi-layered and coincident soil geochemical and geophysical anomalies that heightens our ongoing technical analysis of the southern portion of the project area for future drill targeting." The Southeast copper showing is located within a northwest trending, 650m by 125m multi-element soil anomaly which is currently open in all directions, except to the southeast. The zone is underlain by mixed andesite and dacite volcanic rocks with moderate high and locally variable IP chargeability and resistivity geophysical anomalies and a magnetic low signature. Rock and soil samples were bagged, sealed and delivered directly to the Bureau Veritas ("BV") preparation facility in Maimon Dominican Republic where they were dried, crushed (or sieved in the case of soils) and pulverized. Sample pulps were then delivered to BV facilities in Vancouver BC (an ISO 9001 accredited facility) for analyses. Sample pulps were then delivered to BV facilities in Vancouver British Columbia Canada for analyses (an ISO 9001 accredited facility). Samples were crushed to with more than 70% passing 2mm mesh and split using a riffle splitter (code PRP70-250). An approximately 250 gram sub-sample split was pulverized to minus 200 mesh (74µm). A 15 gram sub-split from the resulting pulp was then subjected to aqua regia digestion and multi-element ICP-ES/MS analysis (code AQ201) and an additional 30 gram pulp spilt subjected to fire assay for gold (ICP-ES finish) (code FA330-Au) for select gold results greater than 0.5 ppm, additionally select samples with highly anomalous copper values were subjected to additional multi-acid AAS analysis (code MA401); All coarse rejects and pulps are currently stored at BV.